Why do heart rates vary during training and how can I properly adjust my heart rate within specific training zones? Find the answer to this and other related question in this blog. A few weeks ago we reported about the fluctuation of heart rates withing a training session. We were able to prove that heart rates are not neccessarily a parameter that stays constant during a specific training intensity. Instead, the heart rate always varies under strain, whether or not excercise is steady in nature or intermitting. The heart rate regulates the oxygen supply in relation to the training intensity. One important detail: The oxygen consumption changes according to the metabolism and used fuels. The larger the share of fatty acids of the energy supply, the higher the oxygen consumption. Furthermore, the amount of produced CO2 of each metabolic pathways (carbohydrate and fatty acids) differs, with the ratio of CO2 and O2 shifting. Our method of ergospirometry measures all those parameters thus providing an exact insight into the metabolism during training. In our blog a few weeks ago we observed a 60-minute exercise of constant intensity of 180W on a bicycle. We were able to measure a continuous increase of the heart rate. Chart 1 below demonstrates the metabolism (calculated percentage of carbohydrates and fatty acids of the energy supply). Chart 1: Analysis of the metabolism during constant intensity with prior food consumption [blue = carbohydrates (g/h); orange = fatty acids (g/h)]. One concludes that the percentage of fatty acids (orange) permanently increased over the course of the exercise with food having been consumed about two hours prior to the test. 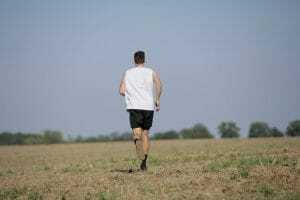 It is safe to assume that all carbohydrate stores were filled and that carbohydrates were present in the blood stream when exercise was started. At the beginning of the exercise our muscle now consumed approx. 130 g carbohyxdrates and approx. 12g fatty acids per hour (see Chart 1). Over the course of the exercise carbohydrates were permanently consumed. The result is a slow but constant reduction of the carboyhydrate availability. That explains the steady increase of fatty acids of the energy supply. The metabolization of fatty acids requires more oxygen. As a consequence, our heart is forced to beat faster in order to supply more oxygen to the muscles. 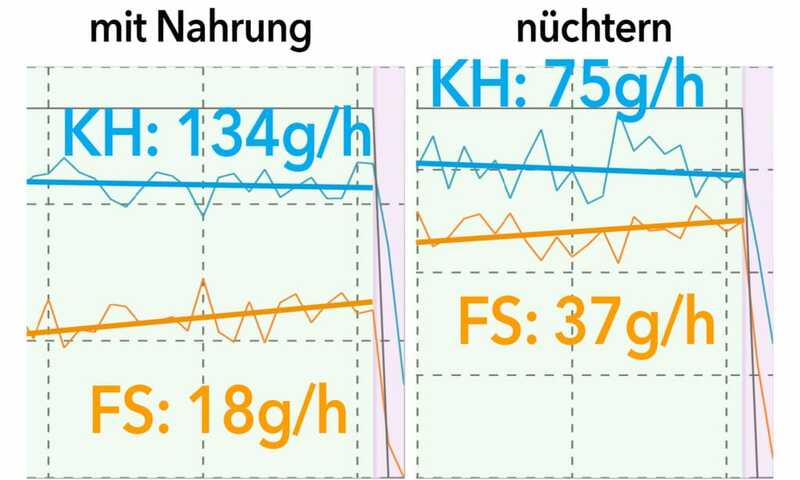 To verify the accuracy of our results, we repeated the training session the following week under identical conditions (same day of the week, time of day, prior exercise). The only difference: food had been consumed the night before, 12 hours prior to the test. One can assume that the availability of carbohydrates was already low at the beginnning of the excercise. This was clearly reflected in the measured data (Chart 2). Again we measured a steady increase of fatty acids of the energy supply. In total, the percentage of consumed fatty acids was higher compared to the test a week before. On average, compared to 75 g carbohydrates and 37 g fatty acids per hour, 134 g carbohydrates and 18 g fatty acids per hour were consumed (chart 3). Chart 3: Consumtion of carbohydrates and fatty acids during training with and without eating prior to training. It comes as no surprise that the average measured heart rate under fasting conditions was higher (chart 4). Chart 4: Heart rate course during training with and without eating prior to training. While heart rate-based training is a useful tool to obtain general information about your training intesity and your personal fitness, it is important to be aware that strictly heart rate based training (especially with a focus on intensity) will likely lead to inefficent workouts. Our data points out why it is important to know and evaluate your body, while considering that the strain-relevant heart rate may vary significantly. Our analyses determine a variety of patterns and explain them in a way that enable you to comprehend and create your own training routines, while being able to interpret potential variations independently. You need more information about “Training with Heartrate? With our performance diagnostics we can help you to optimize your training! Individual performance diagnostic for you!